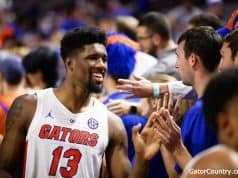 An opening round win by the Gators over the higher seeded Nevada Wolf Pack felt tremendous but the Gators don’t have much time to celebrate as they now face the suffocating defense and tactically masterful offense of the John Beilein-led Michigan Wolverines. Right after the Gators finished off the Wolf Pack the Wolverines went to work on Montana, easily dispatching them 74-55 to earn a matchup with Florida. Known in recent history as an offensive juggernaut the hiring of defensive mastermind Luke Yaklich as an assistant coach two summers ago transformed Michigan into a monster on that side of the ball, earning them top-5 defensive ratings in KenPom the past two seasons. With Michigan displaying excellence on both sides of the basketball the Gators are going to have their hands full but in the NCAA Tournament anything can happen. Here’s what I think we can expect from the matchup. In those 7 games they are 3-4 and the North Carolina and Purdue wins were both at home late in November and early December with those teams not playing their best basketball. North Carolina had just lost to Texas who didn’t make the NCAA Tournament and Purdue was in a stretch where they had lost 5 of 7 including losses to Texas and a Notre Dame team that was nowhere near making the Big Dance. While Michigan is a very good basketball team they haven’t beat a lot of outstanding opponents this year and that should make them look a hair less intimidating when the Gators see them on Saturday. Let’s get to know the key characters in the production we’ll see play out Saturday. Ignas Brazdeikis is Michigan’s leading scorer at 15.0 points per game. A wide-bodied 6’7”, they actually use him as the ball handler in a lot of screen and rolls and he can pull up from three where he’s shooting 41%. Zavier Simpson is a point guard in the truest sense of the word. He’s undersized but a fantastic defender and while he doesn’t shoot well and struggles to finish inside he can really pass it. Jon Teske is the 7’1” anchor in the paint who has been nailing three pointers recently and also has great hands inside. He moves his feet deceptively well and is an outstanding defensive player. Jordan Poole, Charles Matthews, and Isaiah Livers are all versatile, interchangeable wings that give Coach Belein all the offensive options he wants. Poole is a streaky shooter that can make some difficult shots, while Charles Matthews is excellent at driving the basketball and finishing. Livers is far and away the most dangerous shooter and when you put it all together they are the prototypical wing group for the modern game. Alright, I hyped up their defense before so it’s time to explain exactly why I think they’re so dominant. Firstly, their priority is to run their opponents off the three-point line and not allow those higher-value attempts. An analytically driven schematic move, this doesn’t allow opponents to go on many runs because they just don’t get the opportunity to put up 3 points on a single trip. Michigan is third in the country at limiting the 3-ball and it’s likely Florida is not going to have a lot of chances to put up those jump shots. KeVaughn Allen and Jalen Hudson are going to need to show some patience because we know they want to put up threes but against a Michigan team that’s looking to limit those attempts the Gators guards can’t chuck up bad threes just for the sake of putting up threes. Part of the reason why they can be so aggressive in running people off the 3-point line is the fact they have Jon Teske patrolling the paint behind them. Super positionally sound, Teske is an excellent rim protector and he deters a lot more shots than he actually gets his fingertips on. 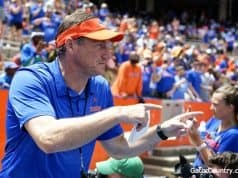 He’s the anchor of their defense and he really allows them to run the scheme assistant coach and defensive coordinator Luke Yaklich puts in place. While they are 5th in the country in 3-point percentage defense, they are 12th in 2-point percentage defense with their impressive protectection at the rim and when you take away the rim and the 3-point line you don’t leave your opponents with many options to score. 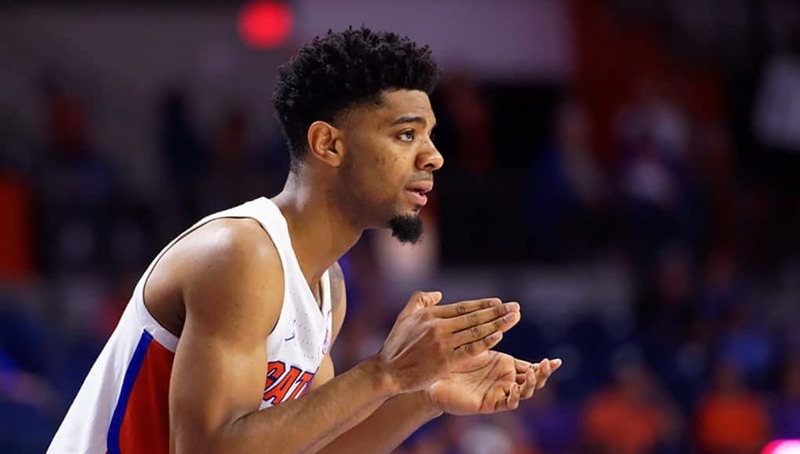 Attacking this structurally sound defense is probably going to keep Florida’s coaching staff up at night as they try to figure out where on the floor they can get high-value shots. Another reason Michigan is so dominant defensively is that they are and tremendous at defending pick and rolls, an action every single team in the country is going do a lot no matter what system they run. Much of their pick and roll defensive ability comes from how good of a defender Jon Teske is and how he allows them to guard in different ways when his man sets the screen. Often times they will hedge ball screens, having Teske jump out towards the ball handler to force him towards midcourt and taking away any ability they had to get into the paint. His size and shot blocking also allows him to just sit back in the paint and wall off the rim, allowing the player guarding the ball handler to go overtop of the screen to take away the 3-point threat while Teske takes away the rim, therefor only giving up midrange jumpers. Michigan will switch a lot of ball screens too and their versatile wing group of Charles Matthews, Jordan Poole, and Isaiah Livers allows them to be pretty interchangeable. One matchup I do like for the Gators is Keyontae Johnson at the four spot being opposed by Ignas Brazdeikis who isn’t a plus athlete. While KeVaughn Allen and Jalen Hudson might not have favorable matchups to drive I think Johnson could get around Brazdeikis and that could force Michigan to scramble. Another interesting matchup is at the point guard spot with Andrew Nembhard being guarded by the much smaller 6’0” (perhaps listed generously) Zavier Simpson. Simpson is actually an outstanding defender but Nembhard’s length should give him some passing lanes and we know what Nembhard can do with those. Michigan is a team that plays supremely connected defensively and finding one or two matchups the Gators feel good about and picking on them might be their best option to try and put up points. John Beilein is an artist and his canvas is the grease board where he draws up some of the best offensive sets in the country. Running complicated actions with multiple screens and false actions meant to confuse the defense and force tough decisions Michigan can be extremely tough to defend, especially with a quick turnaround like the first weekend of the NCAA Tournament. Leading the Wolverines in scoring is freshman Ignas Brazdeikis who usually creates some interesting matchup problems with his unique skill set. Though he’s a bigger forward he handles the ball a lot and orchestrates a lot of screen and rolls putting opposing power forwards in a lot of uncomfortable situations they aren’t used to. Point guard Zavier Simpson also kick starts a lot of possessions with his quickness with the ball but the Gators should know he isn’t much of a threat to score himself and they shouldn’t send too much help when he starts driving the ball. Once the ball gets moving for Michigan within one of their sets they are at their best when Charles Matthews or Isaiah Livers starts attacking closeouts. They are both smooth athletes with good skill and finishing ability and they really challenge defenses with their ability to get into the paint and either finish themselves or find open shooters if the defense collapses. Isaiah Livers (44%), Ignas Brazdeikis (41%), and Jordan Poole (37%) are all fantastic shooters and they thrive off catch and shoot opportunities generated by Beilein’s offenses. One thing interesting about Michigan this year is that they don’t actually get out into transition a ton. They want to make it a half court game which is exactly what Florida wants so I’m expecting a game without a lot of run-outs. 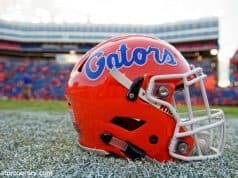 I fully expect the Gators to play their 3-quarter-court press to take time off the clock which should limit the time Florida needs to run through screens and read Michigan’s electric offense. I’m guessing Florida will sprinkle in the extended 1-3-1 defense that helped with them the Nevada game though I think it should be noted that Beilein’s teams used to play 1-3-1 a lot of he might be comfortable with drawing up an offense that exploits it. Michigan’s offensive splits are very similar between when they play man and zone this year so there isn’t a discernable difference but I think it’ll be wise for the Gators to change things up at times to see what works the best. A final stat that speaks to Michigan’s offensive efficiency is the fact that they are 1st in the country in offensive steal percentage, meaning they are excellent at taking care of the ball. Florida is 31st in the country at steal percentage so they usually force a lot of turnovers but they may not be able to do it against a really intelligent Michigan team. Defensive rebounding has been a problem for the Gators at times and luckily for them Michigan doesn’t actually offensive rebound a ton, ranked 293rd in the country in offensive rebound percentage. They prefer to not send players to the glass and instead just fall back so they don’t even get caught in transition though they might change things up against a Gators team that has shown at times to struggle on the glass and also doesn’t pose a major threat in transition. Michigan is a rock solid defensive rebounding team which speaks a bit to their discipline in boxing out but also speaks to how good their defense is and how they usually stay in great defensive rebounding position throughout a possession. Michigan is an extremely fundamentally sound basketball team and their stout defense and poetic offense impresses me to the point of being pretty nervous for the Gators. One encouraging factor for me is the fact Michigan hasn’t been able to dismantle a lot of great teams even though all the metrics suggest they should have. Florida has had a lot of success this year by slowing down teams that want to play fast but against a Michigan team that wants to play slow they won’t have the advantage of dictating pace. This is going to be a half court basketball game and the team that executes best will win out and that could be a challenge for the Gators. I think this is going to be an extremely hard fought game played in the low 60s but if Florida’s shot makers like KeVaughn Allen, Jalen Hudson, and Noah Locke come to play I think the Gators could come out on top.